describe Maggie Thompson, but she would be the first to point the finger back at the students in class of 2018 at the Auburn University College of Veterinary Medicine. The 120-member class, led by Thompson during their four years of veterinary medical education, will receive their Doctor of Veterinary Medicine degrees in a commencement ceremony on Tuesday, May 8, at 6 p.m. in Auburn Arena. “I cannot make enough positive remarks about my time at Auburn and the quality of education and mentorship received,” the Andalusia, Alabama, native said. “Our professors and clinicians, who are among the most intelligent and driven individuals in our profession, are incredibly passionate about their roles as our teachers. Thompson has not walked the average path of a future veterinarian. Although she loves all animals, her future plans include avian medicine and working to ensure one of the nation’s largest industries, the poultry industry, remains vital in both the United States and the world. And, it’s an industry that continues to need veterinarians—providing the U.S. $469.6 billion in economic activity, according to the U.S. Egg and Poultry Association. “My goal is to specialize in avian medicine [commercial poultry medicine],” Thompson said. “I received a Bachelor of Science degree in poultry science from Auburn and through my undergraduate experiences, I developed an interest in poultry medicine and the role a veterinarian plays in this aspect of production agriculture. Thompson spent the last eight weeks in a preceptorship program with Koch Foods, the fifth largest broiler company in the U.S., which processed approximately 50 million pounds of chicken meat in 2016. 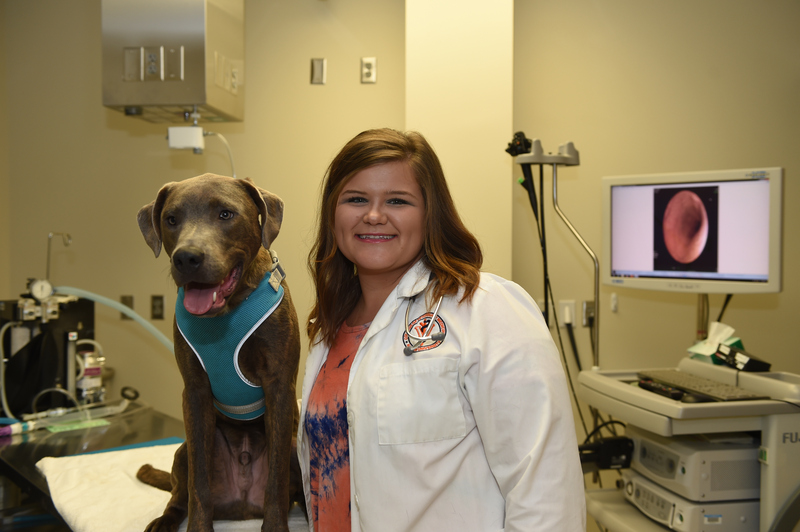 “I reached out to Dr. Victoria Drouet-Pratt [of the Auburn veterinary class of 2010], director of veterinary services for Koch Foods, who did not hesitate when asked to host my preceptorship,” Thompson said. Maggie Thompson’s future plans include avian medicine. 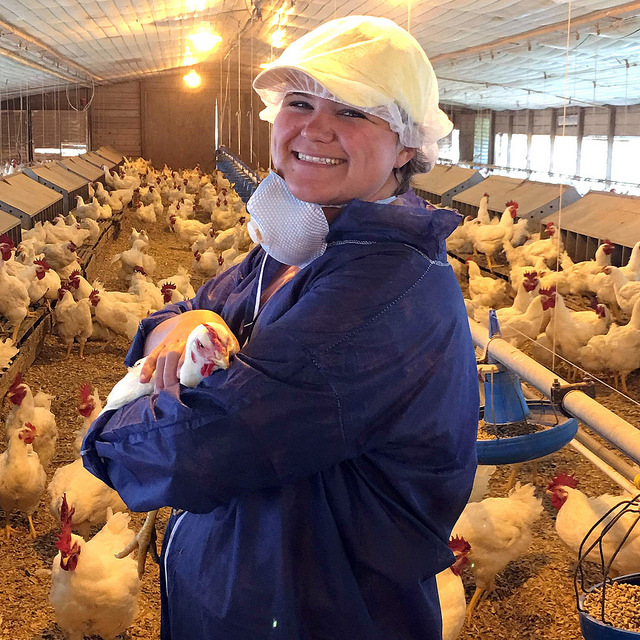 Thompson says her career goals include working in the U.S. commercial poultry industry with professionals and farmers “to ensure that poultry production continues to be safe, wholesome and affordable. Thompson, like most veterinary students, is an achiever with unwavering passion, and has much to show for her hard work. She was selected to receive the SGA Outstanding Student Award, voted on by students and presented to a fourth-year student who is outstanding in scholastic abilities, school activities and extracurricular activities. Thompson was also selected as a President’s Award recipient, given to a fourth-year student in recognition of outstanding scholarship, leadership, citizenship and character. During her four years at the college, Thompson has been recognized every year with an academic or scholarship award, including the William & Judith Harris Endowed Scholarship and the Walter J. Gibbons Memorial Award. “I cannot imagine experiencing this vet school journey with anyone else and I often tell my classmates that I would only repeat the past four years if they were with me,” she added.